The underlying meanings in the verse are played out in subtle expressions underneath the veneer of a costume drama in which everyone is playing parts, for each other and for us the audience. The Acting Company, Guthrie Theater, McGuire Proscenium Stage, Minneapolis, Minn.
From left, Hamlet (John Skelley) talks with Rosencrantz (Grant Fletcher Prewitt) and Guildenstern (Ian Gould) in The Acting Company's production of Tom Stoppard's Rosencrantz and Guildenstern Are Dead at the Guthrie Theater. Photo by Michael Lamont, Guthrie Theater. Although we enter the theater to modern music, this will be the most thoroughly classic rendition of Hamlet you could imagine. Even the sign language interpreters are wearing Elizabethan clothes. Costume designer Candice Donnelly dresses the actors in ruff collars, wide-hipped, brocaded dresses, and codpiece-adorned breeches billowing out over tights. Neil Patel's set is stone arches and columns, a simple design for this traveling production by The Acting Company. The action is somewhat stagey, and the actors tend to speechify the verse, although key subtleties in their performances inform the plot development. It is all so academically formal yet intriguingly acted. Then Guildenstern and Rosencrantz enter for the first time, and Rosencrantz is flipping a coin. Ah-hah! Many a company has combined in repertory William Shakespeare's Hamlet with Tom Stoppard's Rosencrantz and Guildenstern Are Dead, illustrating how the latter weaves in and out of the former's plotline. However, The Acting Company's repertory, ending its tour with this run at Minneapolis's Guthrie Theater, doesn't merely use Shakespeare's original to establish the basis for Stoppard's modern classic; it uses the latter to inform the staging of the former, illustrating how Stoppard's thesis—theater as a representation of life (and death)—plays out with Shakespeare's classic creation. This Hamlet is obvious theater that nevertheless becomes real as life for the audience, on stage and off. My own thesis here may be faulty, given that the two productions have two different directors, Ian Belknap for Hamlet and John Rando for Rosencrantz and Guildenstern Are Dead. However, the visual cue to Stoppard's play with the arrival of Rosencrantz and Guildenstern in Shakespeare's play altered my own attitude toward Belknap's staging, which grew in my estimation because of it. Watching Stoppard's play the following afternoon further enhanced my appreciation of Belknap's Hamlet the evening before. Seeing these two renditions in tandem offers up a whole that is greater than the sum of its parts. And its parts, especially Rosencrantz and Guildenstern Are Dead, are fulfilling in and of themselves. 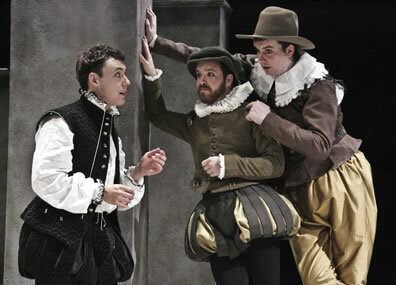 A key element is the casting of the three titular roles: John Skelley as Hamlet, Grant Fletcher Prewitt as Rosencrantz , and Ian Gould as Guildenstern. Prewitt and Gould make, respectively, a Laurel and Hardy comic combo in the Stoppard play that seeps into their appearances in Hamlet; Guildenstern is the large, pompous Oliver Hardy, Rosencrantz the small, childlike Stan Laurel. The differences in their heights, their clothing, and their manners of speaking make them a duo that can hardly be confused with each other; yet everybody does, in both plays, and in their own play, they themselves are not certain which of them is who. That is one of many clues that we are not watching a play about real life but characters brought to life by their existence inside a play. Gould and Prewitt, so smoothly comical as Guildenstern and Rosencrantz, also play, respectively, Bernardo and Marcellus in Hamlet, plus the two gravediggers. I've never seen such tripling before, but it makes perfect logistical sense. In this production, it also makes perfect stylistic sense. The gravediggers are clearly comic relief, and this production continues a trend I've seen of late toward finding humor in the lines of the soldiers guarding the rampart and dealing with a ghost on cold nights. Prewitt's and Gould's presentation of Rosencrantz and Guildenstern similarly brings out the comic potential of those roles. Notably, Hamlet serves as straight man to one or the other actor, or both, in all three of their incarnations of guard, gravedigger, former friend. In his own play, Skelley's Hamlet is the melancholy Dane of yore, dressed in black, dark circles around his sleepless eyes, and a distancing disposition. Yet, in Stoppard's play he is more comic than tragic, and in the boat trip to England he shows himself to be a whimsical youth with the soul of a Machiavellian schemer—which, if you think about it, fits his own description of himself to Horatio upon his return to Elsinore. As with Hamlet's titular counterparts, the Stoppard version of the character seeps into Skelly's portrayal in Shakespeare's play, as he gives a glint-eyed performance and engages in comic direct-address with the audience. It's a serious Hamlet we can't really take too seriously as he bangs his head against the wall after an encounter with Polonius or slaps his face silly at all the Elsinore insanity around him. Despite Hamlet's despondency and later cruelty, we maintain sympathy with Skelly's version of the character. The scenes shared by both plays do not exactly replicate each other in these two productions. Such scenes in Rosencrantz and Guildenstern Are Dead are played in a comical vein in keeping with the overall tone of Stoppard's play compared to those scenes' more serious comportments in Hamlet. Andy Nogasky's Polonius in particular is two different characters, an old man with some sense of dignity in Hamlet, and a blubbering old fop in Rosencrantz and Guildenstern Are Dead. The comic highlight of Rosencrantz and Guildenstern Are Dead—and let me reiterate that the laughs come frequently in this production, but this moment inspires applause—is the scene from Hamlet in which the prince first encounters his old buddies. This scene is missing in Stoppard's script: he starts the scene at the end of his Act One, inserts a blackout and starts Act Two with the ending of the scene. The Acting Company turns Stoppard's three-act structure into a two-act production, so this scene from Hamlet is performed in its entirety—but sped up. While a recording of the dialogue plays as if a 33 LP were running to 78 rpm, the actors perform the same blocking they use in Hamlet but at triple speed. Great idea, brilliantly executed. Rando also departs from Stoppard by inserting the "To be" soliloquy—sort of—in his version of Rosencrantz and Guildenstern Are Dead. With Rosencrantz and Guildenstern caught in the middle of the staged entrapment of Hamlet by Ophelia as Claudius and Polonius listen behind the arras, Skelley enters, stops stage center facing the audience as he does in Hamlet, but silently mouths the entire soliloquy to himself. Rosencrantz and Guildenstern plus Ophelia off to the side, and then king and counselor peering from behind the arras, all watch in bewilderment. One significant difference between the plays' shared scenes is the ever-present guard using the tip of his spear to keep close control of Rosencrantz and Guildenstern in Hamlet. It is a comic device in their Shakespearean scenes that is completely absent in their Stoppardian iterations, and though it inspires chuckles, the device actually serves as a visual image of a pointed motif in this production of Hamlet: Denmark really is a prison, and Claudius its warden. This explains the stagey, speech-mannered performance of Patrick Lane as Claudius. Looking like a classic painting of the young Henry VIII, this king is always on stage, performing whether to the whole of Elsinore in the throne room or with his wife or closest counselors in his closet. In his opening scene, he is given to laughing at almost everything he says, presenting himself as so gosh darn funny and forcing cheer on a court that may or may not be given to such merriment (but in this Elsinore, everybody behaves as cheerily as they can, excepting Hamlet and, because of Hamlet, Ophelia). Only when Claudius is alone—speaking the aside admitting his brother's murder and when he attempts to pray for salvation—does Lane give the character any human depth. Yet, watch Lane closely even in his public scenes. When he announces that Hamlet is his chosen successor, we see a bit of political expediency in the announcement, an initial attempt to ward off a challenge to his crown by the true heir (and Skelley's Hamlet looks incredulous, knowing he should already be king). Lane's tone changes slightly—but significantly—when he tells young Hamlet that his returning to Wittenberg is "most retrograde to our desire." His tone and frozen smile clearly say, "You're staying here where I can keep an eye on you, young man," and the young man again looks perturbed, for now he is as good as sentenced to a term in this prison of Elsinore. This production works on these two levels. The underlying meanings in the verse are played out in subtle expressions underneath the veneer of a costume drama in which everyone is playing parts, for each other and for us the audience. Jacqueline Correa looks very much like a young Elizabeth I playing Gertrude playing a queen, loving wife, and doting mother. Nogasky looks very much like a William Cecil, Lord Burghley playing Polonius playing a wise advisor to the king. Robert David Grant looks very much like a dashing Essex playing Laertes playing devoted son in both familial love and revengeful anger. Even Skelley playing Hamlet seems to be playacting the part of melancholy lad grieving the death of his father. "'Seems,' madam?' Nay it is: I know not 'seems,'" he says, but Skelley's Hamlet doth protest too much. One character who doesn't realize she's in a play is Angela Janas as Ophelia. She never got the director's note telling her she's a duteous daughter or a devoted sister or a member of a court in transition. She's, as Polonius calls her, a "green girl," and as Janas plays her, this Ophelia dotes in idolatry on Lord Hamlet. That is her only bearing in life. In the opening court scene, she maintains a steady, pitying gaze at the sad Hamlet, and in doing so she draws the attention of Claudius (she's not laughing at his jokes), who then looks toward Hamlet with some annoyance before finally acknowledging his stepson in public (he had stolen a quick glance at Hamlet in his opening lines referring to the kingdom's grief over the elder Hamlet's sudden death). Ophelia's completely overwhelmed with confusion in the nunnery scene, but she remains so smitten with Hamlet heading into the Mousetrap scene that she fails to pick up on his cynical swagger and misunderstands his leering, bawdy puns. Janas then plays the mad Ophelia as totally rudderless, a true throw-caution-to-the-winds performance. 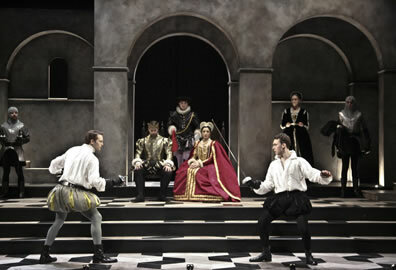 Laertes (Robert David Grant) and Hamlet (John Skelley) square off in the climactic duel in The Acting Company's production of Hamlet as Claudius (Patrick Lane) and Gertrude (Jacqueline Correa) watch, along with Osric (Joshua Johnston) and an attendant (Suzy Kohane). The guards at either end are Marcellus (Grant Fletcher Prewitt) and Bernardo (Ian Gould). Photo by Michael Lamont, Guthrie Theater. Rosencrantz and Guildenstern also don't seem to be aware they are playing parts in Hamlet. They know they are supposed to, and they know enough to do courteous duty to the royal members of the cast, but they otherwise can't find their footing when interacting with Hamlet, Claudius, or even Gertrude. In their own play, we find out why: they are merely characters plopped into somebody else's play. "Do you remember the first thing that happened today?" Guildenstern asks Rosencrantz. All they remember is a summons—which is the extent of their backstory in Hamlet (what their actual relationship is to Hamlet, Shakespeare never explains). They are at the mercy of a script (the coins always turn up heads) and unable to leave their stage until the playwright no longer needs them. To dispense with them, the playwright works out a ploy to kill them off, and when we hear they are dead, they simply vanish from the stage. "Who are we?" asks Guildenstern when he learns their fate. "You are Rosencrantz and Guildenstern. That's enough," replies The Player, an explanation that fails to satisfy either Rosencrantz or Guildenstern who keep insisting they've done nothing to deserve their fate. In the part of The Player (played in both productions with gleeful animation by Darien Battle), Stoppard presents his somewhat satirical observations about the theater profession and actors, who exist only on the whims of a paying audience. But through the persons of Rosencrantz and Guildenstern, theater becomes a metaphor for life, in which all the world's a stage and every person plays a role. That, of course, is Shakespeare's famous metaphor, too, from another play; but Stoppard inserts the specter of a scriptwriter dictating our fates and making our deaths play out as entertainment for the living—even grieving can seem a self-serving enterprise carried forth for the sole sake of the survivors. Guildenstern cannot accept The Player's explanation that death, even staged deaths, are what audiences believe in, what they expect. While Stoppard uses two minor characters in Hamlet to play out his metaphor, The Acting Company use Hamlet to demonstrate Stoppard's metaphor. The play opens with guards in Tudor armor using flashlights—battery torches, not flame ones—to find their way in the dark. That should tip you off to the fact you are about to watch nonreality despite the details in the costumes and the ubiquitously classical Shakespeare stage set. Yet, when Gertrude takes the goblet of poisoned wine in the climactic scene, a 20-something woman behind me whispered, "Oh my God, she's going to drink it!" Yes, there are still people new to Hamlet. And, yes, they believe that what they are seeing on stage is real life, in some existential sense, at least.